Two up. Two down. Two up. There are just some teams you look forward to facing, especially when you need an easy victory. The Boston Celtics were a welcome sight on Sunday. And the same could be said about the Utah Jazz tonight. With the Thunder looking to solidify their footing in the Western Conference while awaiting the return of Russell Westbrook, facing teams like Boston and Utah makes life that much easier for the team as they trudge along without their star point guard. This is the 3rd meeting of the season between these division rivals. The Thunder won the first game, 101-98, behind 42 points from Kevin Durant. The 2nd game was much more one-sided with the Thunder winning 95-73. The common denominator in both games was that Russell Westbrook was inactive for both, with him recovering from surgery in the first game and resting in the second meeting. 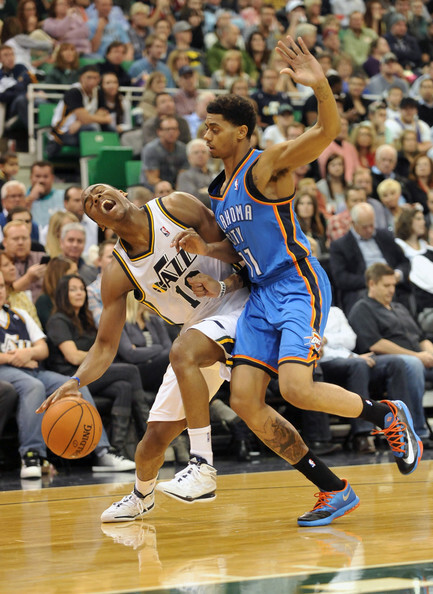 The Utah Jazz are a bad team, either by design or by happenstance. They currently sit at 11-25 and are in the bottom third of most statistical categories. It’s no secret that Utah is currently in a rebuilding phase. Their core consists of young players who are still learning the nuances of the game. Rookie point guard Trey Burke is starting to show flashes of what made him the National Player of the Year in college basketball last season. Gordon Hayward is their leading scorer at 16.5 points per game and has started to get his game back after starting the season abysmally. Up front, Derrick Favors is close to averaging a double double, while Enes Kanter has fallen out of the starting line-up and is one of the key reserves off the bench. Serge Ibaka is out with flu-like symptoms. 1. Small ball – Utah trots out a starting line-up that basically features a point guard, 3 small forwards, and a power forward. This may be one of those games where the strengths of Kendrick Perkins and Steven Adams are marginalized. If Scott Brooks decides to keep a traditional line-up in the game for too much time, it may come back to bite the Thunder in the rear. 2. Bench – Utah’s bench, like it’s team, is loaded with young developing players. While the Thunder’s is also filled with young player, I think there’s enough veteran leadership off the Thunder’s bench to take advantage of the Jazz’s youth off the pine. 3. 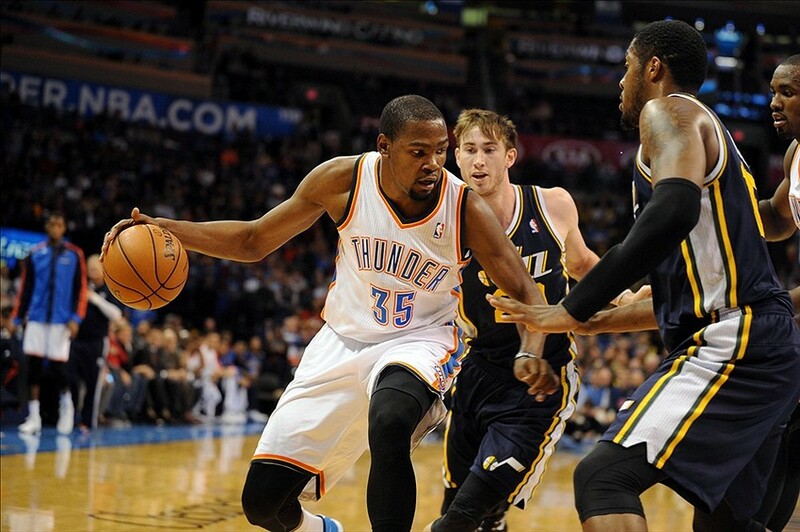 That man Kevin – Kevin Durant has been on a tear lately and Utah doesn’t really have any one that can cover him. Feast Kevin, and hopefully, enjoy the 4th quarter on the bench.